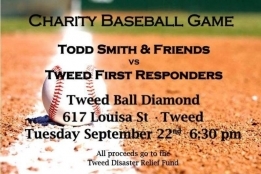 On Tuesday September 22nd at 6.30 PM Todd Smith & Friends will take on the Tweed & Area First Responders (EMS, Fire, & Police) in a friendly baseball match at the Tweed Fairgrounds Ball Diamond. The event is in support of the Ontario Disaster Relief Assistance Program, and funds will be raised to support flood relief efforts from the Spring flooding in 2014. Come out Tuesday evening and support this fundraising effort!